Welcome to a new world - wheelchairs that stand you up to provide independence and a new level of mobility that redefines your life! Since 1975, when our first stand-up wheelchair was introduced, increasing the quality of life became the top priority of LEVO. This priority assures a focus on the design and development of new products offered to you our customers. The experts in standing – this statement is an obligation. As the first provider of this kind of product worldwide, LEVO offers a complete range of stand-up wheelchairs, which meet all individual preferences and requirements with respect to size, type of disability or location. In this way, LEVO assists the integration of disabled people into the wider community. We offer stand-up wheelchairs for children and adults. Our chairs are available in manually propelled and powered standing or as a fully powered model. The adjustability of the height, width, and angle for the footrest, seat, armrest and backrest on all LEVO models combined with a variety of accessories allows for optimal biomechanical adjustment. 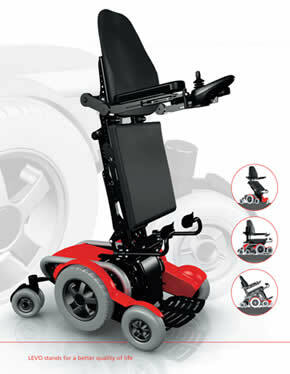 Since our innovative stand-up wheelchairs are designed to meet individual needs, LEVO has become the world leader in manual and power electric standing technology wheelchairs.